Many lead gen services sell the lead to 5 different contractors or companies, meaning the lead is “shared” and therefore exponentially more difficult to convert. For a lead to hold real value it has to be what is known as an exclusive lead. An exclusive lead, instead of being sold to 5 companies, is sold to only one. The chances of converting an exclusive lead is much greater, which should come as a surprise to no one. The problem is that many services don’t clarify the types of lead they are actually selling. Younger roofers go in wide-eyed, expecting these leads to major dividends, and end up being dissapointed when they find out what they actually entail. 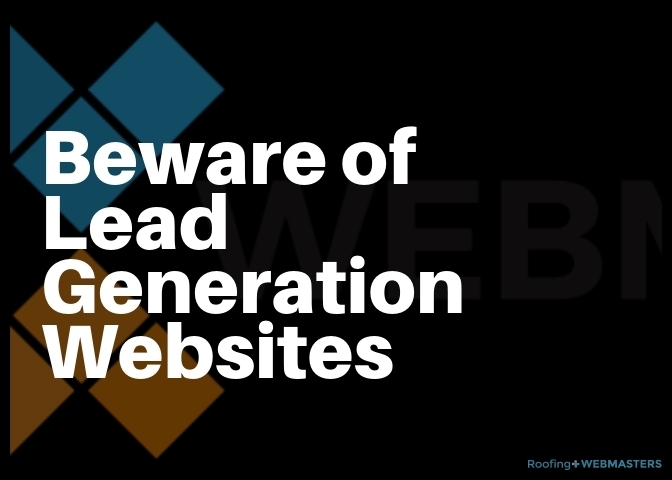 Another issue common to roofers who invest in lead generation sites is the absence of quality from the leads. Some of them are so porous that calling them “leads” is actually a stretch. For example, if you run a commercial roofing company, and you get a prospect who’s looking only for residential repairs, you’re fresh out of luck. You never had any chance of converting them, so categorizing them as a lead seems foolish and becomes a sunk cost if registered as one by the service. Sometimes the lead is not even in the wrong category, it’s in the wrong industry. For example, someone looking for air duct cleaning should not be considered a lead for a roofer, let alone a quality one. Why do so many low-quality, irrelevant “leads” come through these services? Because most use programmed automation to screen for leads. They make the assumption that any phone call or form submission is a lead for your company. And good luck trying to get your money back once you do. For some of these platforms, refunds are a grueling process and one that can drain a roofer’s energy from more important tasks. We know this because we have hundreds of clients who’ve dealt with these kinds of services. Even some lead gen sites that sell exclusive leads, are using a platform that encourages multiple companies to compete for the same lead. While they aren’t technically selling a lead to multiple contractors or companies, they are using a lead shopping platform that empowers the prospective roofing client to shop for multiple options, and subsequently to make multiple calls. It’s important to understand this distinction when evaluating the service. They aren’t shared leads, but they also aren’t exclusive. It can be a confusing equation to solve for roofing businesses throughout the United States. Some lead gen sellers are nothing more than repackaged PPC services salesman. When people talk about “leads for roofers”, particularly on Facebook and other social media platforms, they often mean simply clicks from paid advertising. They often cite the process of funneling the click and producing a lead, but it’s really just a bunch of words in sequence that sounds different than what you already know it to be. That’s not to say that PPC is ineffective, but let’s define it the way that it is intended to be defined. Utilizing Google Ads, and Facebook Ads is actually a good marketing method. Don’t be fooled by a sales pitch that makes the two services seem ambiguous. You should never, under any circumstances, wire money to a lead gen seller. You may have heard about lead gen services that call areas impacted by hail storms and try to get leads from because of the increased demand for roofers. While this sometimes works, if they ask for a wire transfer upfront, you should avoid it at all costs. They will tantalize you with the idea of cheap leads in a high-demand location. You can’t take the bait in situations like these. There’s no way to get your money back once you commit to a wire transfer. With other forms of payment, you would have a chance for a refund. Not to mention, they are much safer. Our experience dealing with contractors throughout the nation has given us unique insights into their mindset when it comes to leads. We’ve found those that come to us with the problems mentioned in the earlier part of this post are frustrated with what they’re paying and not impressed with the results. We’ve also seen a shift when they notice the quality of leads that come from our service agreement. Since our leads come through organic channels, like those listed above, they are inherently branded. This makes them exclusive, valuable, and worth buying. If you would like to sign up for Pay Per Lead services give us a call at (800) 353-5758.